Choose the right fire extinguisher for your home with our guide and reviews. We decide which model is best in a variety of scenarios. Need a general purpose model? One for the kitchen? Or one that's lightweight? We've got you covered! Deaths from fires ranks as the 5th most common reason for unintentional deaths in the USA. In 2015, on average someone died in a fire every 160 minutes, or was injured every 33.5 minutes. It is also estimated that $14.3 billion worth of property damage was caused by fires in the same year. Of course, an extinguisher can't replace a good fire safety plan and alarm system, but it can play a crucial role in stopping a fire from growing and spreading throughout a home. The threat of fire is one that is impossible to escape, but we can be prepared for it. 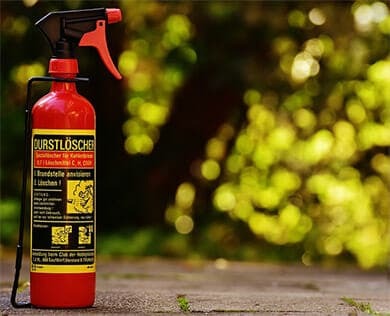 In this post, we recommend the best home fire extinguishers for general use and also for kitchens. If you're new to household fire extinguishers and are unsure about what kind you need then don't miss our comprehensive guide. What are the Different Classes Available? What Makes Them All Different? Due to the sheer number of different types of extinguisher available, choosing the right one for your situation can be a little confusing. Furthermore, it's absolutely crucial that you use the appropriate type of extinguisher on each fire type. For example, the best fire extinguisher for kitchen fires caused by hot oil just isn't going to be an effective tool against fires causes by paper. But, we'll explain all this in the following few paragraphs. In this section, we aim to make the selection process a bit easier. We explain the different models and which classification you need for your home. Fire extinguishers come in many shapes and sizes. Putting out a fire is not a "one fits all" approach and fire extinguishers each specialize in a specific type of fire. 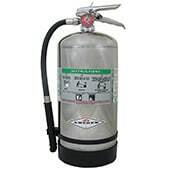 There are extinguishers for electrical fires, kitchen fires, automobile fires.... the list goes on and on. In this section, we list and explain each type of model available. Household fires are split into 5 categories. Each category refers to the fuel that caused the fire. Fires started in different ways can be put out more easily with specific extinguishers. 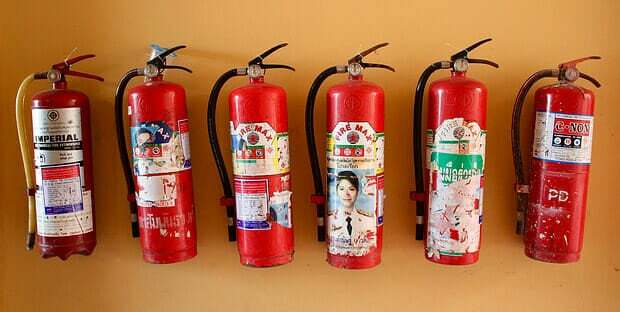 Some types of fire extinguisher can be used on multiple types of fire, but some have warnings that they should not be used with particular types of fire. Let's take a look at the categories of fires. There is a special type of fire extinguisher for each category. The categories are simply called A, B, C, D, and K.
Class A: This class describes fires caused by solid combustibles. It includes things like paper, wood, rubber, plastics, trash, and cloth. But, it excludes metals. Class B: These are fires caused by flammable liquids. These include things like gasoline, grease, oil, and paint. It also includes flammable gases like butane and propane. Class C: These are electrical fires caused by equipment. Causes might be appliances, transformers, or motors. Class D: These are fires caused by combustible metals. These include sodium, potassium, aluminum, and magnesium. Class K: These are fires caused by cooking oils and grease. Animal fats and vegetable fat can be the causes. Before using an extinguisher, it's really important to know the cause of the fire. By using the wrong type of extinguisher, you can sometimes make the fire worse. Household fires usually fall under the categories of A, B, and C. The general use extinguishers that you often see in schools and public buildings are A,B,C extinguishers. If you're looking for a good general purpose household extinguisher then this is the type you should be looking at. So far we have learned about the 5 classifications of fire. Next, let's take a look at how different types of extinguishers put out these fires. Water & Foam: These work by removing the heat element. The foam also separates the oxygen from other elements. These are only for Class A. They should never be used on Class B or C. They can put the user at risk from an electrical shock in Class C fires. They can spread Class B fires with their discharge stream. Carbon Dioxide: These types of extinguisher work by removing oxygen from the fire, and reducing the heat (the discharge is cold). They can be used on Class B and C fires. They can be pretty ineffective on Class A. Dry Chemical: These work by blocking the chemical reaction. 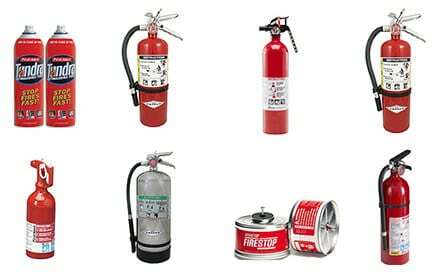 The most common fire extinguishers used are multipurpose types that are effective on Class A, B, and C fires. Regular dry chemical extinguishers are for B & C only. Clean Agent/Halogenated: These work by interrupting the chemical reaction in the fire. They are used for Class B and C fires. Some can also work on Class A fires. Wet Chemical: This is a new method. It reduces the heat and creates a barrier between the fuel and oxygen elements. These are for K Class fires. They are mainly used in commercial kitchens where there are big deep fat fryers. They can also sometimes be used on Class A fires. Some of the best kitchen fire extinguishers are this type. Dry Powder: These separate the oxygen and fuel elements of the fire. These can only be used on Class D fires. Water Mist: These reduce the heat of a fire. They can be used on Class A and Class C fires. Cartridge Operated Dry Chemical: These work by stopping the chemical reaction in the fire. Like the regular dry chemical type, this works on A, B, and C. The regular type works on just B and C.
Most models for home use are the dry chemical type. They can combat Class A, B, and C fires. These are common types of household fire. Some are rechargeable and can be refilled and used again. You can find out how they are recharged in this article. Traditional disposable extinguishers are cheaper and lighter, but they also have a shorter expiry date. 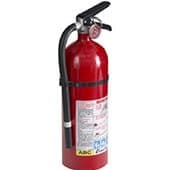 Check out our fire extinguisher reviews to see what types of fire each model can fight. 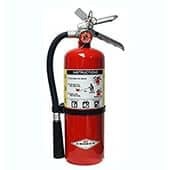 In this section, we give the low down on the top home fire extinguishers for each classification of fire. Compare them in the table below, then read about each in more detail in the reviews that follow. We've covered all of the fire types (A, B, C, D, and K) and a range of different price brackets. For a good general purpose household extinguisher you should be looking at the A, B, C type. Read about each of the extinguishers featured in the comparison table in a bit more detail. We give all the key information, besides our own opinion. The Amerex B441 fire extinguisher for homes is an A, B, and C class extinguisher of the highest quality. The steel cylinder is combined with metal and brass valves, a chrome plated body, and a stainless steel handle and lever. These high-quality materials make the B441 a sturdy and reliable performer. However, it does weigh in at 19 pounds when full. This might be a turn-off for some. The user-friendly design features a large loop pull pin so that it is easily engaged when it is needed. It is also rechargeable. This means that it can be refilled after use. This can be done at your local fire station at a reasonable cost. The canister has a 10 lbs capacity and measures 20.5"(h) x 8.75"(w) x 5"(d). It has a range of between 15 and 21 feet, which is really impressive and is the largest range of the extinguishers that we have featured. Having a large capacity allows it to have a long discharge time of 20 seconds too. Being an Amerex fire extinguisher, it complies with the National Fire Protection Association regulations. It is also independently tested and rated by Underwriter Laboratories and FM Global. It also comes with a huge 6-year warranty. Bottom Line: It's one of the more expensive household fire extinguishers around, but it gives a lot for the money. It's reliably built, has a huge capacity and range, it's rechargeable, and it fights the common household fire types A, B, & C. It also comes with a wall mount. The Amerex B500 is the smaller brother of the B441 we just discussed. It has 1/2 the capacity (5 lbs compared to 10 lbs) and costs around 1/2 the price. Our one criticism of the larger B441 is that it is quite heavy. This model is much smaller and lighter, and therefore more manageable. It is built to last like the larger model and has an all metal valve construction. As the capacity is smaller, the discharge time is also less. The discharge time drops from 20 seconds with the B441 to 14 seconds with this model. It is also capable of fighting A, B, and C class fires. These are the most common types of household fires and include electrical fires, combustibles, and flammables. Like its bigger brother, it is rechargeable. This means it can be refilled by your local fire department. Bottom Line: This solves the weight and size problems of the B441. It's also around 1/2 the price. If you have young or older people in your household then this lighter extinguisher is a great choice. It's a great all-rounder that's probably the best fire extinguisher for homes due to it's lighter weight. 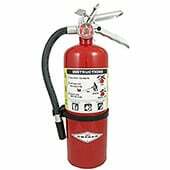 This 4 lbs capacity extinguisher is the cheapest of the larger sized models we have included. It has a fearsome reputation on websites like Amazon, where it commands very high review scores from hundreds of customers. Like the previous two reviews, this model combats A, B and C class fires (these include fires caused by things like paper, electrical equipment, wood, trash etc). It is lighter than the previous two and this is down to its smaller size and also its aluminum cylinder. Despite being a bit smaller than the Amerex models, it is able to discharge for an impressive 13 to 15 seconds. The discharge range is an equally impressive 10 to 15 feet. The Kidde Pro 210 is also rechargeable, so you can get it refilled at your local fire department at a very reasonable cost. It also comes with a massive 6-year warranty, and wall mounting brackets. Bottom Line: This model is very reasonably priced and has some great performance features. 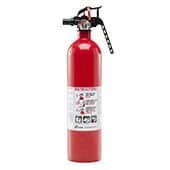 It's one of the best home fire extinguishers for smaller builds. This disposable fire extinguisher for homes is an Amazon bestseller. The main reason for this is the amazing value it offers. It has a 3-pound capacity, weighs less than 4 lbs, and measures just 3.2" x 3.2" x 13.8". This makes it small enough to fit in a cupboard or under a sink. It is capable of fighting class A, B, and C fires, which makes it ideal for use in the home. Despite being small in size it still has some very good performance statistics. It has a discharge time of 8-12 seconds, and a discharge range of 6-8 feet. This model is not rechargeable, and so has to be replaced after use or when it expires. The benefit of this is that it is much cheaper. It comes with a 6-year warranty. Bottom Line: This model is really great value. It's so affordable that multiple devices could be installed around the home. It's also one of the best auto fire extinguishers due to its compact size. 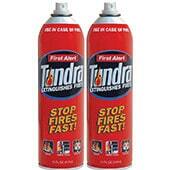 The First Alert Tundra extinguishers are the first disposable type that we have featured (not the last). This means they are significantly cheaper but not as good for the environment (as they need completely replaced after use or after the expiration date). Like most of our featured models, it will combat fire types A, B, and C. This makes it particularly useful for household use. It comes in a twin pack, at a really attractive price. A really nice feature of this extinguisher is that it is just a simple spray can. That means no overly complicated procedure to use it. Just press the top down and whoooosh! The fact that it is a pressurized aerosol can give it a bit of extra range too. First Alert say that it has a 4 times greater discharge time when compared to conventional household fire extinguishers. It will give at least 32 seconds of discharge, which is very impressive. The actual media spray is easily cleaned up with a damp cloth and is completely biodegradable. Bottom Line: The cans are smaller and more lightweight than traditional units. This makes them a great fit for homes where mobility might be an issue. This Stovetop Firestop is a really clever idea, which is unique in our recommendations. The unit is magnetic and designed to attach to the underside of a range hood. When a fire is detected it automatically opens up and drops the fire suppressing chemicals onto the fire below. Kitchen fires caused by unattended pots and pans are a common reason for household fires. This model deals with the threat in a really innovative way. This model is made for traditional range hoods that are around 27 to 35 inches above the cooking surface. Bottom Line: The automatic action is really impressive and reacts much faster to a fire than a distracted person would. This wet chemical extinguisher is perfect for use in a restaurant kitchen. It is primarily a class K type extinguisher, which means it will combat fires caused by cooking oils and grease. It works by reducing the heat of the fire and creating a barrier between the fuel and oxygen elements. It can also be used on class A fires caused by solid combustibles like wood and paper. This model has a huge 6 Liter capacity and as a consequence is quite heavy. It has an enormous discharge time of 53 seconds and can be used at a range of 10-12 feet from the fire. Like the other more expensive extinguishers, it is rechargeable. This means it can be refilled at your local fire station. It has been tested and approved for Class K listing by UL. It also comes with a 5-year warranty. 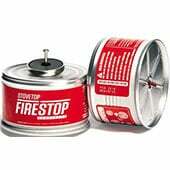 ​Bottom Line: Possibly the best fire extinguisher for kitchens, and especially those with deep fat fryers. Fighting a fire should not be attempted unless some important steps have been taken. Activate the alarm or call 911. Assist any people in danger to exit the building. But, don't put yourself at extra risk. Attempt to put out the fire. It's a small and contained fire. You have an escape route. You aren't at risk from hazardous smoke. Your instincts aren't telling you it's a stupid idea. You know how to use an extinguisher properly. There isn't time for you to learn during a fire. Using a fire extinguisher can differ slightly with each brand and model, but it's generally the same technique. You should never stand closer than 6 feet to the fire, and you should remember one easy word: PASS. PASS stands for pull, aim, squeeze, sweep. Let's take a look at what each of them mean. Pull: Simply pull the pin. Aim: Aim the nozzle at the base of the fire. Squeeze: Squeeze the handle/lever to spray the extinguisher. Sweep: Sweep the nozzle from one side to the other. Remember to stay at the recommended distance. You should always be prepared for the event of a fire. Make sure you are comfortable with the weight of the extinguisher, as some can be large and heavy. Also, ensure you know the exact location of the extinguishers and exactly what type they are. Be aware of which type of fires your extinguisher is suitable for, and which fire types you should not attempt to extinguish. It's extremely important that you take good care of your firefighting device and inspect it at least once a month. Furthermore, ensure that you are comfortable with how to use it. Ensure that the extinguisher is in a location that is free of obstruction. Make sure there is nothing obscuring it from view or anything that would make accessing it more difficult. Check that the pressure is within the recommended range. Most of the larger models will have a pressure gauge. Make sure that the nozzle or any other parts are not worn or hindered. If the unit has a seal, make sure that it has not been broken. Check the canister body for any dents, rust, leaks, or any other obvious signs of mistreatment or wear. Dry chemical type extinguishers can be gently shaken to stop the powder from packing. Another very important point is to always recharge an extinguisher after use (assuming it's not disposable). This doesn't matter how much of the content was used. Even if you only used it for a couple of seconds, it must be recharged and serviced. You can read more on maintenance and inspections here. So where's the best place to keep one? It is recommended that you should have a fire extinguisher on every floor of your home. This means the basement too. There should be one for the kitchen, as this is where most fires start. There should also be one in the garage, as this commonly contains flammable liquids such as paints and oils. It should be installed in a place that is free of obstruction and is obvious to see. It should also be near to an escape route. Most models come with mounting brackets that allow the unit to be attached to the wall. This makes it easier to keep the extinguisher out of reach of small children too. 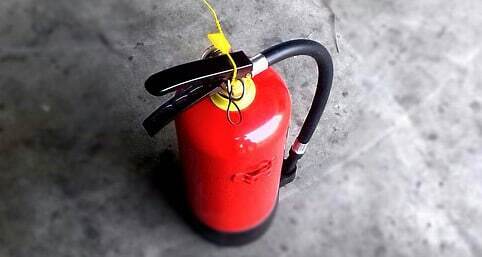 An extinguisher is an important device for stopping a fire from spreading and becoming more threatening. However, having a good fire safety plan and an effective warning system can be the difference between life and death. When a fire breaks out in the home, you have just minutes to evacuate the building and ensure everyone is safe. Here are some tips for formulating an effective strategy in case of fire. Draw a map of your home that includes all of the possible exit points (windows and doors). Share the plan with everyone in the home and make sure they are familiar with it. Display it in a prominent location in the house. Think of multiple ways out of every room. Make sure windows can be opened easily. Arrange a safe meeting place outside where people can meet if there is a fire. This should be a safe distance from the home. Make sure everyone is well rehearsed in the fire safety drill. Practice at both day and night. Teach your children how to escape from the house on their own. You may not be there to help when a fire breaks out. Make sure they are well equipped to act on their own. That brings us to the end of our guide to the top home fire extinguisher reviews. If you have any further questions, then get in contact and we'll do our best to help. Remember the cost of one of these is very insignificant when compared to the cost in damages that a fire can cause. In case you missed it, check out our recent guide to solar panel kits that's proving popular. Check back soon as we'll have more handy guides about making life in a tiny space that bit more convenient. Disclaimer: When used properly these devices are very helpful in containing the spread of fire. They don't stop fires and you must do your best to prevent fires from happening in the first place. This page contains guidelines for their use, but it is in no means a comprehensive reference. We recommend you get in contact with your local fire department for professional fire safety advice.